Shortages of food can occur due to any kind of disaster. Having access to a survival food supply that is uncontaminated by dirty water, toxic air or other disaster-related elements is a necessity conducive to the survival of a far-reaching emergency. Food shortages are another possibility that could happen even without the occurrence of a disaster. Astronomically high prices may make food virtually unavailable to everyone but the very wealthy. "The ability to grow and foster most crops relies, obviously, on water. A water shortage portends a food shortage, which we'll all pay for at the grocery store if produce prices surge." "What We Can Learn From the California Drought"
"The world is less than 40 years away from a food shortage that will have serious implications for people and governments, according to a scientist. "For the first time in human history, food production will be limited on a global scale by the availability of land, water and energy," said a senior science adviser on food security. "Food issues could become as politically destabilizing by 2050 as energy issues are today." Some people, even in the US, have experienced their own personal apocalypse, in the form of job loss, that has left them unable to put food on the table. These people are then waiting in line at food banks and at the mercy of the government, which decides whether to give them food stamps. Knowing how to prepare for a situation concerning inadequate food supplies resulting from weather or economic disasters is the wise man's insurance against disease and starvation. "Effective stockpiling requires preparation, prudence and forward thinking. Knowing which foods to buy and which to ignore will allow you to maximize your food supply during an emergency situation." All of these foods for survival offer a long storage life, as well as being easy to carry or store in a pantry or basement. The goal with storing food safely for long periods is to eliminate exposure to oxygen, insects or microorganisms, which contaminate food and make it dangerous to eat. "Shelf life is very much affected by storage conditions and will be shortened considerably by storing the food where it is subjected to extreme heat, wide temperature fluctuations, moisture, or exposure to pests." While oxygen causes food to decompose due to oxidation, nitrogen is an unreactive element and does not facilitate the rotting process of organic material. Those bags of chips you buy that are only half-full have been filled with nitrogen to prevent spoiling from oxidation. 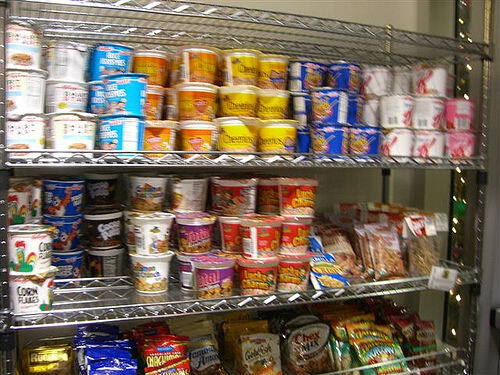 Good foods for survival, such as rice, potato flakes, salt, sugar or other kinds of dried food, can be preserved in bulk by putting the food in a polyethylene plastic bucket that has a tight fitting lid. Place two or three chunks of dry ice into the bucket full of the dried food and lay the lid on top without sealing it yet. Wait for a few minutes until the oxygen has been replaced by carbon dioxide, and then seal the bucket. This procedure will keep oxidation from occurring. HINT: the poor man's way to store dried things like sugar, salt, rice and beans without having to resort to dry ice? Take clean and dry 2-liter soda bottles and fill to about 2 inches from the top. Screw on the lid. Squeeze the side of the bottle, and carefully loosen the cap just enough to hear the trapped air "whoosh!" out. It's now vacuum sealed and ready to be stored in a cool, dark place. While dehydrated vegetables need water to be reconstituted, fruits that have been dehydrated can be eaten as is. When making soup with dried vegetables, just add the vegetables, as they will rehydrate in the soup. When the electricity is out and you do not have a generator, cooking food with a gas or charcoal grill will suffice for a short period. For emergencies of longer duration, investing in a camping stove or solar cooker, along with cast iron skillets or Dutch ovens to use to cook the food, are advantageous as well. Throw away any food that has been contaminated with floodwater. Throw away food that smells unusual or appears abnormally colored. Dispose of perishable items that have been left in conditions above 40 degrees for longer than two hours. Do not check food for contamination by tasting it. Even a small amount of Clostridium botulinum, botulism, can be deadly. Do not use foods in cans that are bulging or already open. Frozen foods that have been thawed but still contain ice crystals may be cooked or refrozen. Just how long people can live without food varies according to their weight, metabolism, hydration rate, the climate in which they live and their personality. The majority of nutritionists estimate that the average person who is not obese or underweight may live up to six weeks without food. However, without water, no one will be able to survive for more than a week, probably less in a hot, arid climate. Avoid these catastrophic scenarios and keep your survival food items stocked and ready in preparation for a disaster that could happen at any time. "We want you to be ready with our personal storehouse filled with at least a year's supply. You don't argue why it cannot be done, you just plan to organize and get it done." Spencer W. Kimball, Aug. 1976.